“Authenticity is about being yourself but sometimes that doesn’t fit the mould of expectations” – Jon Michail. In the final moments of the 2012 Australian Grand Prix, representatives of the world’s media adjusted their microphones and jostled for position in a frantic final race of their own. British ace Jenson Button had taken line honours that day, holding off Red Bull’s Sebastian Vettel and leaving his McLaren teammate, Lewis Hamilton, to claim third place. Their faces lit up by live TV feeds, the drivers smiled into lenses and manoeuvred through the same old questions as if still behind the wheel. The chassis handled well. The medium-compound tyres, a good decision. The win, yes, it felt amazing. But anyone peering beyond the bright lights of that press pack might have spotted a rookie emerging from the far end of the Formula One paddock. It was the kind of blissfully unscripted reaction you’d expect from any loose-lipped young Aussie. Then 22, Ricciardo’s efforts for his new Toro Rosso team were duly noted by F1 writers the world over. He had narrowly dodged the carnage off the grid, pitted on lap one with a damaged front wing and was subsequently forced to the back of the pack. 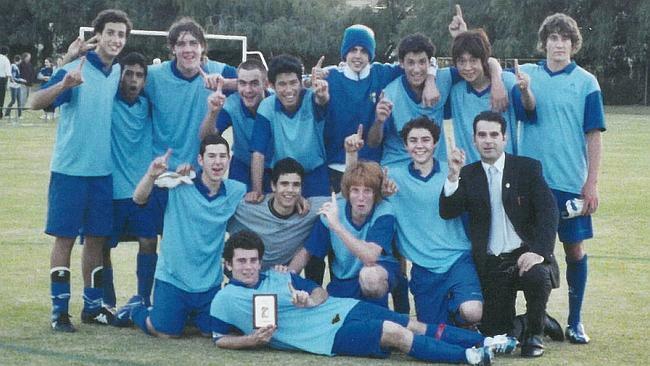 Daniel Ricciardo (far left) with other members of the 2006 Newman College Senior Boys soccer premiership squad in Perth. But by the final lap, the West Australian had made up enormous ground and ended the race in ninth place ahead of his French teammate to secure his first two world championship points. Aside from his determination in the driver’s seat, Ricciardo was also being noticed for his relaxed demeanour — rarely seen in an F1 driver. His easiness was altogether lacking in Aussie predecessor Mark Webber, a master of steely composure and sterile response. Even when the veneer of his tense relationship with teammate Sebastian Vettel started to crack at the Malaysian GP, Webber stayed on-message, summing up their working relationship with short, sharp adjectives. It was a rigid media manner that polarised opinion long before he’d backflipped into a rooftop pool after winning in Monaco. Ricciardo needn’t bother with acrobatics. Such was his popularity at this year’s Australian GP, his life-size poster was stolen from the Avenue of Legends. Ironic, say pundits, because the young star is anything but a cardboard cut-out. 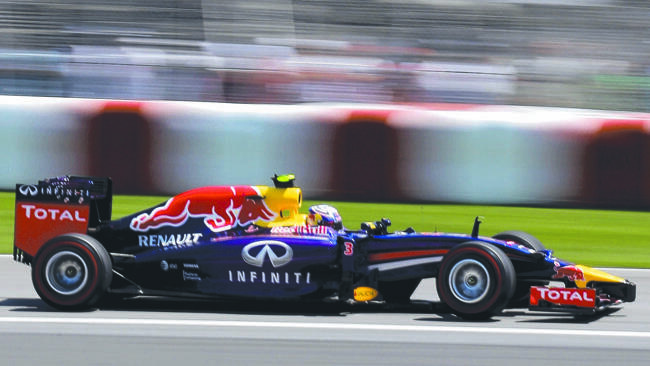 Daniel Ricciardo drives through the course on his way to winning the Canadian Grand Prix. “Ricciardo has already established himself as an authentic brand,” Image Group International chief Jon-Michail said. He said the challenge for Ricciardo now would be to keep his mentors close — and to avoid being manufactured by new advisers. IT was only eight years ago that Ricciardo stood on a soccer pitch in north suburban Perth and prayed with his teammates. The Catholic school squad had nicknamed the midfielder Richie — not because of his surname, but for his seamless impersonation of cricket commentator Richie Benaud. A few token lines from the young mimic could have the boys in stitches. But on this particular day, all jokes were put aside. In each of the two previous years, the Newman College senior squad had been runners-up, and they were determined to claim the premiership in their final year. Coach Dante Bonarrigo still has the team picture sitting in his office. “That elusive trophy had just been out of our grasp,” he said. “We won the game and became the number one senior boys soccer team in Perth. It was euphoric. It is still a personal highlight in my life and I sometimes run into some of the players and we fondly reminisce about that day. “I like to think that some of the discipline, sportsmanship, tenacity, humility and success of winning may have contributed, at least a little, to Daniel’s winning ways,” said his former coach. Those qualities run deep in the Ricciardo clan. Despite the whirlwind of F1 fame around their son, parents Joe and Grace are as grounded as ever. They run a busy earthmoving business and even if they could get to every race, they probably wouldn’t. Joe Ricciardo proudly says his son remains level-headed. The same kid who flashed his pearly whites to the camera after he won a go-kart grand prix as a 10-year-old. “I know he’s my son and people would expect me to say it, but Dan has always been like that,’’ said his father. Even in March, when Ricciardo junior was disqualified despite notching up a podium finish at the Australian Grand Prix, he still managed to showcase his relaxed approach, says his dad. Yeah, it sucked, but there would be another opportunity. RICCIARDO still phones his old mates when he lands in Perth between seasons. They head to the beach or go camping. He gets to spend the downtime with girlfriend Jemma Boskovich. They’ve been together since high school. It’s a near-normal existence for a kid who insists that he never pursued a career in F1 for the glamour. His apartment in Monaco is squashy. Contrary to popular belief, says his dad, there are few frills yet for this champion racer. The one-bedroom flat in the tax haven is barely wide enough to swing a cat. “He has quite the HECS fee to pay back to Red Bull,” Mr Ricciardo said. But he acknowledges that their investment is starting to pay off in plenty of other ways. Since signing with the team, Ricciardo has cemented his relationship with Vettel like Webber never could. The pair are similar in age and personality, and share the same sense of humour. The German four-time world champion was the first person to congratulate Ricciardo after his Canadian GP win, hugging him and lifting him off his feet. There is more respect there, Mr Ricciardo admits. And he says that’s something his son has earned with just as many others. In the moments after winning last week’s race, Ferrari’s Fernando Alonso walked into the Red Bull garage to shake Ricciardo’s hand. The sun hadn’t even come up last Monday when Joe and Grace Ricciardo stumbled from their bedroom, still in Perth’s northern suburbs, and switched on the television. Daniel had qualified in sixth spot to contest the race in Montreal but had openly expressed doubts about whether he or Vettel would be able to cut through the pack. His mum and dad were as surprised as anybody when the Red Bull rookie overtook leader Nico Rosberg on the penultimate lap. And their phones went into meltdown. Daughter Michelle and her husband were at the front door before they knew it, followed by a steady stream of wellwishers and a contingent of media camped on their front lawn. “We didn’t expect that we would be cracking the champagne after the Montreal race … but Daniel came around a bit quicker than we thought,” Mr Ricciardo said. Ever since his son left for Italy to test his potential with some of the world’s top racing teams, Mr Ricciardo said it was clear where he was headed in the sport. And Daniel has said so himself. “I don’t want to just get into Formula One,” he once proclaimed. © 2014 News Limited | This article first appeared in the Herald Sun on 14 June 2014.